On 13 December, at the plenary session of the 2nd Congress of Belarusian scientists, Belarusian President Alexander Lukashenka promised to sign the decree ‘On the Development of Digital Economy’ before the New Year. The fathers of the decree call it revolutionary, because it includes a number of unprecedented measures to liberalise the way IT businesses operate. It aims to turn Belarus into a regional leader in the development of cutting-edge areas, such as artificial intelligence, big data, autonomous cars, and blockchain technology. Both officials and businessmen work to promote it inside the country and with foreign partners, creating perhaps the first case of state-business partnership on such a scale in Belarusian history. The critics accuse the package of privileges to only one sector, lack of public discussion, and playing with poorly understood blockchain technology. In the meantime, Belarusian society silently waits to see what innovations will come their way. On 11 December, President Alexander Lukashenka held a meeting to discuss the draft decree ‘On the Development of Digital Economy’. The talk featured well-known IT businessmen and government officials. According to its developers, the document contains legal solutions that are a breakthrough not only for Belarus and its neighbouring countries, but also for the most developed countries of the world. Lukashenka himself calls it ‘revolutionary’. The decree aims to turn Belarus into a regional centre of attraction for talented specialists, successful companies, and international corporations. The hope is to make Belarus at least a regional leader in the development of cutting-edge areas, such as artificial intelligence, big data, autonomous cars, and blockchain technology. Apart from development of the IT sector, the package includes other important goals: creating conditions for the transformation of traditional industries, and a new educational approach in schools and universities, where students will be able to master at least one foreign language at a high level. The success story of the Belarusian High Tech Park—despite its growing revenue—has been stagnating due to its orientation to outsourcing and lack of its own products. This was the most probable reason to remove the park’s founder, Valier Tsapkala, and replace him with Usievalad Jančeŭski as the new park director in March 2017. Nearly at the same time, President Lukashenka visited the High Tech Park and met with EXPCapital company head Viktor Prokopenya, one of the main promoters of transforming Belarus into an IT-country. According to estimates of the decree’s designers, by 2030 the Belarusian IT sector will grow to 100,000 workers—compared to 30,000 now. Export revenue is projected to grow to $4.7bn a year compared to $1bn today, and foreign investments to increase to $4bn from its current $800m level. Belarus has never boasted a favourable business climate. Although, a number of recent projects with foreign capital have proven successful. This time, the government seems determined to seriously change the situation with unprecedented novelties and adopt some of the world’s best practices. As the officials put it, the package will contain minimum strict formulations to provide a flexible basis for the future development and elaboration of regulations. Most important ideas of the decree concern the following. Foreign companies, which provide marketing, advertising, consulting and other services to the residents of the High Tech Park, will be exempt from paying value-added tax (VAT). For example, today in order to sell a mobile app, a company needs to buy ads from Google and Facebook. For every $100 allocated for advertising, they have to pay $20 VAT and $15 foreign operators’ income tax. Companies in other countries do not pay these taxes, and therefore have a big advantage over Belarusian firms. The decree also removes a number of barriers in electronic transactions. High Tech Park residents will have the right to open accounts in foreign banks and conduct monetary transactions without any regulator permissions. The new system will also introduce aspects of British law and international business standards. Ahead of the publication of the system’s conceptual design, legal company Aleinikov&Partners revealed they are studying the experience of venture investment world leaders—Singapore, Israel, and USA—in cooperation with the Belarusian government. High Tech Park residents will receive privileges for recruitment of foreign specialists. Foreign hires will not need to obtain work permits and will have the right to work in Belarus without visas. Cryptocurrencies received special attention in the document. It fully legalises digital currency tokens and creates conditions for engaging cryptocurrencies into circulation. Tokens can be mined, bought, inherited, exchanged for money, and involved in other similar operations. At least until 1 January 2023, the government exempts this form of activity from taxes. However, individuals may only perform all operations via High Tech Park residents to prevent fraud. The generally positive hype surrounding the decree was somewhat dampened by critics, many of whom agree with the assessment of famous independent economist Siarhiej Čaly. Shortly after his Economics in Layman’s Terms show on TUT.by online TV, where he discussed the potential negative sides of the decree, the top manager of IT company VPCapital, Mikalaj Markoŭnik, published a response to the criticism. Čaly accused the fathers of the decree of not engaging in any public discussion. The High Tech Park administration, however, claims that it chose a different approach—consulting with the industry and expert community. It collected the opinions of all park residents, as well as certain IT companies outside the Park, and consulting companies. Information that the High Tech Park was working to propose a draft decree was public and anyone can still submit ideas and initiatives. Critics also point to the fact that the special regime does not apply to the entire country, but only to residents of the High Tech Park. Proponents respond that the decree does not in fact offer new tax benefits, but rather can be regarded as a de-bureaucratisation test. If successfully passed, it is likely that this approach will be extended to the rest of the economy. 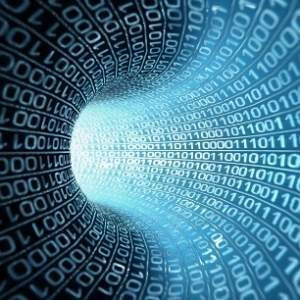 Next, critics claim the boosting of IT sector could potentially destroy the rest of the economy by drawing away talent from other sectors. But Markoŭnik argues that brain-drain to foreign IT companies has long been an issue for the Belarusian economy. He says further development of the High Tech Park will prevent brain-drain, because people will at least remain inside Belarus and work within its economy. Siarhiej Čaly considers cryptocurrency a bubble on a global scale and warns against any investment in it. His opponents argue that regulation of cryptocurrencies in the decree is not simply a tribute to current trends, but a reflection of the way the market is headed. Blockchain and cryptocurrencies certainly do present one of the main trends in the IT world. Although some analysts believe the trend is only beginning, this does not mean that the state should wait at the sidelines. Despite certain critics, most stakeholders remain optimistic. The decree represents unprecedented liberalisation of one of Belarus’s most important economic spheres. Both officials and businessmen are working to promote it inside the country and with foreign partners, creating perhaps the first case of state-business partnership on such a scale in Belarusian history. The coming year will demonstrate whether Belarus can indeed become a Slavic Hong Kong, as fathers of the decree wishfully put it. On 17 November 2017, the official statistical body of Belarus, Belstat, announced that GDP growth for ten months of the year has reached a new high outscoring the previous month’s record. However, state-owned enterprises are still unable to significantly improve their cost-effectiveness, which delivers additional pain to their creditors threatening the banking stability of Belarus. In the meantime, on 23 November 2017, the Belarusian President Alexander Lukashenka has signed a presidential decree aimed at improving Belarus’s business climate. According to Belstat, from January–November 2017, GDP growth continued and reached 2 per cent year on year (see Figure 1). The main contributor to economic growth remains to be exports supported by increased demand within Belarus’s traditional external markets. In particular, foreign counterparts (for example, China) display a belated interest in certain Belarusian goods, mainly potash fertilisers, as well as a range of capital goods exported to Russia. As a result, the figures of the first nine months of the year indicate that export of goods has increased by 20 per cent. Correspondingly, industrial production is steadily recovering. The effect of “belated” external demand plays a crucial role here. Domestic demand, on the other hand, is mostly negated by the associated growth of imports for intermediate goods. Additionally, Belarusian families are gradually restoring their consumption levels comparable to the “rich” years of the 2000s. This happened mainly because households started to believe that recession in the economy has ended, which subsequently will lead to growth in their real incomes. However, the reverse side of increased consumption means the growth consumer goods imports. For many households, the normalization of consumption also means more imported goods in their consumer basket. Finally, another major component of GDP—capital investments—has also grown. After a downturn in the first half of the year, capital investments have gained in size and number. In October, they grew by 2 per cent year on year. The state-owned enterprise sector remains the key challenge for Belarus’s economy. In 2015–2016, devaluations of the national currency and government financial rehabilitation efforts combined to reduce costs for Belarusian firms. In addition, low domestic demand for imports (in comparison to the past two years) gave some “fresh air” to improve export competitiveness. However, without permanent state support, a large number of the state-owned enterprises (SOEs) would be unable to sustain operations or generate profits. State directed redistribution of resources limits capabilities for the development of efficient firms and the economy in general. For example, Jaroslav Romanchuk, Executive Director for Strategy, an analytics centre, notes that 60 per cent of agricultural enterprises and a quarter of industrial enterprises remain unprofitable and are unable to survive without state support. Moreover, Romanchuk says that half of all construction organizations work at a loss. These inefficiencies compound the increasing inability of state-owned enterprises to repay their debts. This results in budget coverage of their obligations and investments in fixed capital (see Figure 2). 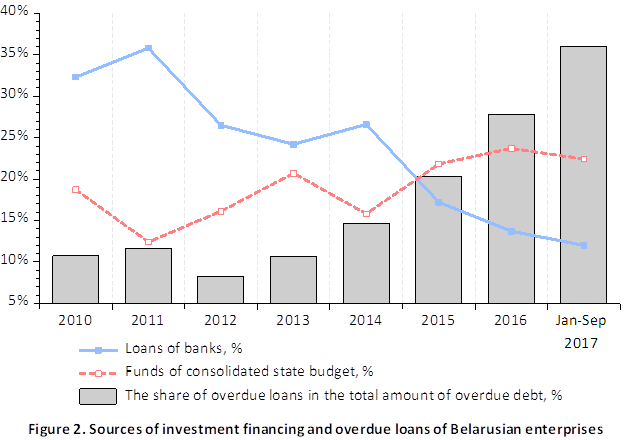 Since 2015, Belarusian enterprises have demonstrated a steady decline in the acquisition bank loans with a corresponding build up of overdue debts, which consequently threatens the financial stability of the entire banking system. The trends described above—a fall in issued loans, and rises in overdue loans and consolidated state budget funds—happened, first of all, due to the high cost of capital for SOEs during the past two years of economic recession. Second, the inefficiency of investment modernization programs from previous years failed to deliver substantial profits. On 23 November 2017, President Lukashenka signed the presidential decree “On Enterprise Development.” The decree contains a package of government-drafted ordinances aimed at improving Belarus’s business climate. In a major change, the decree introduces a notification system for businesses engaging in activities such as, among others, consumer and tourism services, trade, food services, passenger transportation, and the production of building materials. This means that a business may merely notify local authorities of its plans to start engaging in such activities, which requires the filling out of electronic form, and then it can begin operations the following day. Additionally, the decree shortens the list of mandatory operational requirements for businesses, removing many sanitary, environmental, and other regulations that have manifested into business-stifling red tape. The result is that Belarus currently ranks 38th in the World Bank’s Ease of Doing Business 2018—a drop of only one position in comparison with the previous year. World Bank experts have noted the downgrade occurred due to a drop in the tempo of legislative reforms intended to improve conditions for entrepreneurship in the country. Additionally, World Bank expert and co-author of a study into the Belarusian economy Valentina Saltane argues the second factor that limits the attractiveness of doing business in Belarus, in particular, is the high tax burden for businesses. According to Saltane, Belarus ranks 96th in the world in terms of taxation weight (the first place being the least burdensome). The overall rate of taxes and duties in relation to an organisation’s profit in Belarus is 52.9 per cent. For example, in Europe and Central Asia this figure hovers around 33.1 per cent. In high-income OECD countries, the ratio reaches 40.1 per cent. 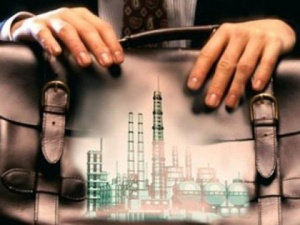 Therefore, Saltane concludes that Belarus should do more in order to reduce the tax burden. Meanwhile, in 2016 President Lukashenka set a strategic goal for the government to reduce all types of production and sales costs by a quarter. The aim was to improve the competitiveness of the national economy. However, without reduction of the tax burden on business, this goal still seems unachievable. 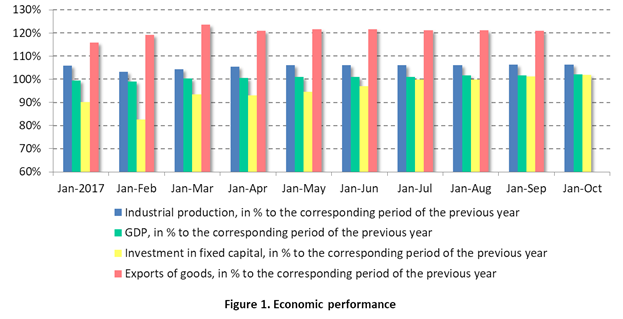 Thus, in November Belarus’s economy has continued the growth of recent months. The rise in exports and industrial production are delivering positive economic prospects for the year. However, problems with the business climate and the cost-effectiveness of SOEs threaten the stability of the banking system and the sustainability of economic growth in the coming years.